a random collection of helpful hints for prospective pharmacy students; combined with tidbits of information from our side of the admissions process; and a bit of spice -- for flavor! The application deadline for our Interprofessional Health Post-Baccalaureate Certificate Program is fast approaching. 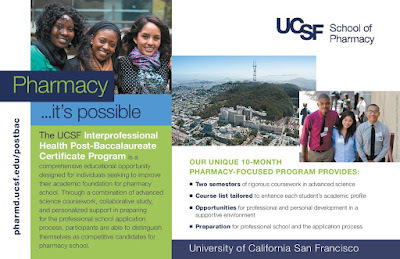 For more information on this incredible PharmD-preparation program, please visit our website. Joel is the Director of Admissions for the Doctor of Pharmacy (PharmD) program at University of California, San Francisco, one of the top-ranked pharmacy schools in the United States. Nothing in this blog is required reading for our PharmD application process, but you're likely to find valuable tips that can ease your journey. While I welcome feedback and general questions, please know that not all questions can be responded to via the blog. Suggestions for future blog posts are encouraged! A New Curriculum -- Change Is In The Air! © The Regents of the University of California. Original background pattern #158 by squidfingers.